Without the aid of the internet to research - let's keep it at least to a national level to avoid getting too esoteric. Limit of three guesses by any one participant per question. Whoever gets it right sets the next motorsport question. Name the first man to ever score a F1 World Championship point in a four wheel drive car. 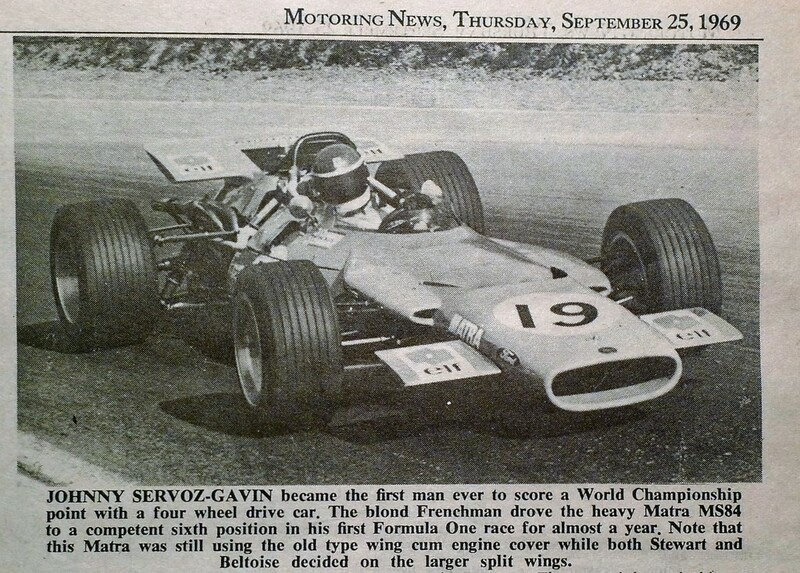 Johnny Servoz-Gavin. What about national level, F1?? Who finished last in the first ever World of Outlaws points race? It'll either be Steve Kinser or someone I've never heard of, so I have to go with the former. What is World of Outlaws? Is it like when UK hillclimbers and European racers have a go? Without a web search, I don't have a clue about World of Outlaws. Thank you! Now a fluffy bit of numerical trivia. Recently, Lewis Hamilton notched up his 44th world championship race win, whilst driving a car numbered 44. Many drivers have done this previously (xth win in car numbered x), but Lewis is only the second driver to have done it more than once - having scored his 2nd WDC race win in car number 2. The other driver to have done it more than once actually did it 3 times. Name him. Edited by E.B., 15 July 2016 - 18:21. I think you missed another one who did it only twice - Jody Scheckter! Denny Hulme. Germany 1967 (second win); Mexico 1969 (fifth win); Sweden 1973 (seventh win). Number 5 is the most "popular" x value - eight drivers have taken their 5th win in number 5. The lowest x value yet to be achieved is 10, and the highest that had been achieved prior to Lewis' 44 was Senna in number 12 (Hungary 1988), although he came one Japanese DQ from claiming his 27th in number 27 (Italy 1990). What number - to three decimal places - is common to Donald Campbell's 1964 Land Speed Record and John Cobb's 1947 Land Speed Record? Cryptic clue: there are two possible answers, although both are correct. That would be nothing to do with the cost, right? Just out of curiosity, who won his first GP with #1? I said world championship races, so think of a couple of drivers wearing number 1 by dint of being the defending US National champions and I think you will know them! Richard, a guess: since Campbell recorded identical times on both of his runs, was his speed the same as Cobb's fastest? The number would then be 403.135 (mph) or 648.784 (kph). Edited by Michael Ferner, 16 July 2016 - 18:35. Uh, I cheated and googled it to find I was right. But I have to admit that I needed to cheat "a little bit" even before, because being a know-nothing about LSR attempts, I looked up a list of LSR in a book I have, only to find Donald Campbell wasn't even listed! So, I put in "Donald Campbell" and 1964 in a newspaper archive, to find the story about both runs being the same speed, plus a cryptic note that he was disappointed about not reaching Craig Breedlove's speed, but still it was feted as a LSR - now I am really confused!! Was it, or wasn't it? Indeed, Michael. Well guessed! It's a remarkable coincidence, but Campbell's speed was exactly the same as Cobb's faster run. Unfortunately, Cobb couldn't manage it again and his average ended up just short of his 400mph target. He was the first to break 600kph though. Breedlove's record wasn't recognised at the time because the FIA rules said that cars had to be wheel-driven. That changed in 1965 and Breedlove duly took the LSR to over 600mph with Spirit of America. All right, I'll make it easy: What were the last names of the first two drivers to retire from the 1908 Tourist Trophy? At the end of the strip, he stopped; certain he had been too slow. “That wretched track,” he growled. A man came running from the radio tent. “Four hundred and three,” he shouted. And in that fashion, Donald Campbell learned of the end of his long quest for the world land speed record. In fact, the average was 403.1 miles per hour (648.7km/h). A timekeeper later told me the Bluebird passed the end marker at more than 430 mph, still accelerating. 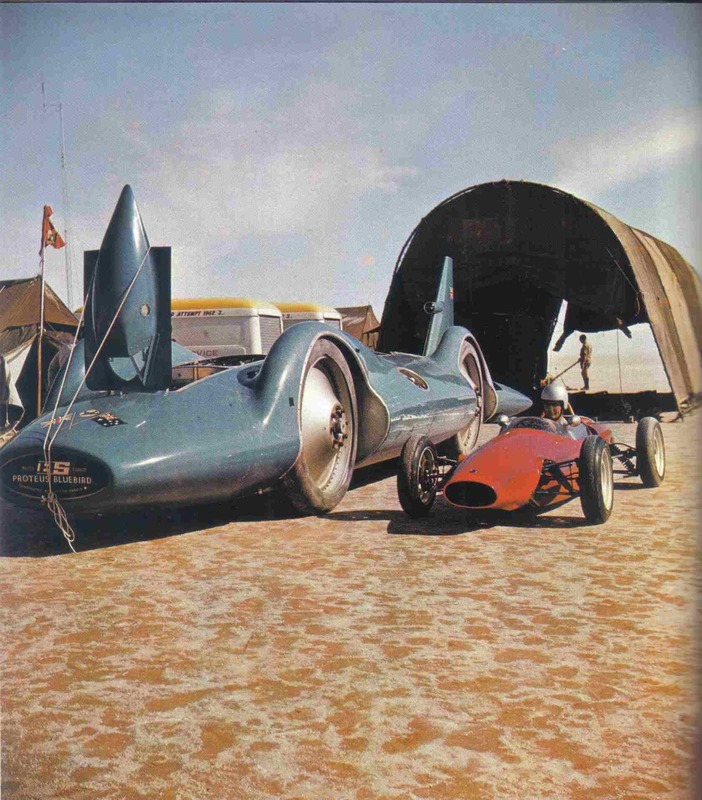 The full story of Campbell's 1964 LSR, as described by brilliant Evan Green, is here: Donald Campbell and his Bluebird car world speed record: An inside look at the man, the fear, the Bluebird and the lake. My personal coincidence here is that today in the morning I decided to start re-reading of marvellous book by Evan Green about his experience in 1974 London-Sahara-Munich World Cup Rally "A Boot Full Of Right Arms". And finally to end with coincidences: it's already 17th July in Australia, thus we are marking the 52nd anniversary of Campbell's 1964 LSR! I think in terms of one of the biggest advances made, although it was not strictly speaking a racing car, was Bluebird. Arguably for its time it was the most advanced vehicle.’ The Bluebird Proteus CN7 was the car that Donald Campbell used to set a record of 403.1mph in July, 1964, the last outright land speed record car that was wheel driven. It was a revolutionary car that featured an advanced aluminium honeycomb chassis, featured fully independent suspension and four-wheel drive. It also had a head-up display for Campbell. ‘It was the first car to properly recognise, and use, ground effects,’ says Newey. ‘The installation of the jet turbines is a nightmare, and it was constructed using a monocoque working with a lot of lightweight structures. It was built in a way that you build an aircraft, but at the time motor racing teams weren’t doing that.’ The car featured a Bristol-Siddeley Proteus gas turbine engine that developed over 4,000bhp. It was a two-spool, reverse flow gas turbine engine that was specially modified to have a drive shaft at each end of the engine, to separate fixed ratio gearboxes on each axle. It was designed to do 500mph, but surface conditions, brought about by adverse weather in 1963 and 1964, meant that its fastest recorded time was nearly 100mph short of its hypothetical capability. It is interesting to note that, should an exact replica be built today, and it did achieve its potential, it would beat the existing record of 470.444mph set by Don Vesco’s Vesco Turbinator in 2001, and still be the fastest wheel-driven car today. Edited by AAA-Eagle, 17 July 2016 - 10:55. Johnnie Woodrow Parsons being first at 1950 International Sweepstakes bearing #1. James Ernest Bryan would done the same thing eight years later. Name the driver who promissed to his father that if he won the Indy 500 he would retire from racing. But when he achived his goal and won the Indianapolis 500 Miler, his father told him not to retire: "Since you won the biggest race in the world and if you still like what you are doing, it will be fine with me if you will keep on doing it". As I understand it from reading the race reports in Autosport, it was only at the last race of the season in Mexico that the drive to the front wheels was completely disconnected, but the torque split to the front wheels had been reducing from race to race. And there I was, trying to set an uncontroversial opening question! From what I was told, the FW drive was "disconnected" for the three races, but it might be a little oversimplified. It could well be that, at the time, the Matra people didn't want the world to know that they'd given up on 4WD, so made out it was still in use when it wasn't. However, in the wet practice session at Watkins Glen, Stewart did a number of laps in the MS84. There wouldn't have been much point in this unless he was evaluating how 4WD performed in wet conditions. However, in the wet practice session at Watkins Glen, Stewart did a number of laps in the MS84. There wouldn't have been much point in this unless he was evaluating how 4WD performed in wet conditions. Didn't know that. You've certainly got a valid point there. Well, nobody seems to be trying to answer Eagle's question, so I'll start the ball rolling: Joe Boyer? I'm thinking it's the sort of obscure story that might only be known via a biography or autobiography, so my guesses will consist entirely of 500 winners whose books I haven't read! I will start off with Pete de Paolo. I think you might be right there. Pete's autobiography Wall Smacker is available for just £2.49 on Kindle, BTW. Quite an entertaining read. Good efforts, but the answer is still to be found. Clue: this driver was defending US National Champion when he won the International Sweepstakes. With the Bluebird concidences of today, I may as well add another. I stumbled upon this while looking for something else. And if John Cooper was still with us, he'd be 93 today. Hmmm. Haven't read Wilbur Shaw's book either, but he wasn't national champ at the time of his first 500 win. Jimmy Bryan doesn't really fit, as he did semi retire at about that time. So, bookless though he may well be, the wink makes me think it's related to the discussion from my earlier question yesterday, so I'll go with Johnnie Parsons. The photo is from 1963 unsuccessful attempt to set LSR at Lake Eyre. The driver of Elfin Catalina is Ted Townsend, a Dunlop tyre fitter. This Elfin chassis was built for Dunlop Tyres for use on the Lake Eyre salt to determine certain characteristics for the tyres that were fitted to Donald Campbell's Bluebird land speed record attempts during 1963. The Elfin was fitted with 'miniature Bluebird tyres" and driven over the salt to determine factors such as co-efficient of friction and adhesion using a Tapley meter. The Tapley Brake Test Meter is a scientific instrument of very high accuracy, still used today. It consists of a finely balanced pendulum free to respond to any changes in speed or angle, working through a quadrant gear train to rotate a needle round a dial. The vehicle is then driven along a level road at about 20 miles per hour, and the brakes fully applied. When the vehicle has stopped the brake efficiency reading can be taken from the figure shown by the recording needle on the inner brake scale, whilst stopping distance readings are taken from the outer scale figures. It is believed that the Elfin was running a (relatively) normal pushrod 1500cc Cortina engine with A3 cam and Weber DCOE carburettors for the Bluebird support runs. 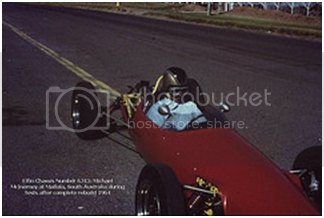 • a heavily modified head by Alexander Rowe (a Speedway legend and co-founder of the Ramsay-Rowe Special midget) running around 5:1 compression and a solid copper head gasket/decompression plate. The head had been worked within an inch of it’s life, and shone like a mirror. The head gasket on the other hand was a weak spot, lasting only twenty seconds before failing. As runs had to be performed back-to-back within an hour, the team became very good at removing the head, annealing the copper gasket with an oxy torch and buttoning it all up again... inside thirty minutes. • the standing start mile record (34.03s, 106mph). • a straight cut 1st gear in a VW gearbox. The clutch struggled to keep up with the torque being put out by the Norman blown Elfin, and was replaced with a 9” grinding disk, splined in the centre and fitted with brass buttons... it was either all in, or all out. In the twin Norman supercharged guise the vehicle was driven by McInerney to pursue the standing ¼ mile, standing 400m and flying kilometre records in October 1965. Sadly, the twin-Norman supercharged Elfin no longer holds those records, as the ¼ mile and flying kilometre (together with a few more records) were set at this time by Alex Smith in a Valano Special. The car was used for training the South Australian Police Force driving instructors in advanced handling techniques, and regularly used at Mallala and other venues (closed meetings for the Austin 7 club, etc). It was sold by Mustard to Dean Rainsford of South Australia in 1966, though sadly without the Norman supercharger (by then it was running the mildly tuned Cortina engine again). The vehicle continued adding to it’s racing history, with Rainsford droving it to a win in the 1966 Australian 1½ Litre Championship Round 4 (the Victorian Trophy, Sandown, Victoria on the 16th of October 1966). In the ensuing twentysix years it passed through nine more owners before Rainsford re-acquired it in 1993. After many years of fossicking, Rainsford has located the original Mustard/McInerney supercharged engine used in the 1965 record attempts, but sadly without it’s Norman supercharger.